Please note there is a limit of 2 Medication Travel Pack purchases per member/non-member. The ATF Medication Travel Pack is not available from the ATF Office. Purchases are only available from the Online Shop or by ordering from the ATF Membership Team – 0416 100 284. Postage adjustments will be calculated for 2 packs and/or express delivery. Please phone our membership team on 0416 100 284 for further information when ordering 2 packs or express delivery. Become an ATF Member today to also access one-on-one support and member information to help you manage your thyroid health and education including research and medical information supported by ATF Medical Advisors. you're an ATF Member, login to your Membership Account to purchase a Medication Travel Pack. After receiving many concerns from ATF Members about keeping Oroxine and Eutroxsig cool whilst travelling, The ATF Committee resourced The ATF Medication Travel Pack to be available as one of our Members Services, for members of the ATF to purchase as a solution to travelling with Oroxine and Eutroxsig. PLEASE NOTE: Shipping Rates do apply to this product. Orders will be received until close of business on Wednesday 19th December . Orders will commence for 2019 on Wednesday 2nd January 2019. Become an ATF Member today and enjoy the many benefit of Membership, including the opportunity to purchase an ATF Medication Travel Pack. The ATF Medication Travel Pack is designed for transportation and cool storage of Thyroxine Replacement Hormone, (Oroxine and Eutroxsig). The Australian Thyroid Foundation recommend Oroxine and Eutroxsig should be stored in the refrigerator all of the time and not left out of the refrigerator for any reason. This is to avoid any possibility of spoilage, due to heat or light. The Medication Travel Pack holds enough blister strips for an extended overseas trip of approximately 6 weeks, depending on your dose. The Medication Travel Pack includes a secure strap to hold blister strips in place. The Medication Travel Pack is to be placed in the freezer compartment of the refrigerator and frozen inside the accompanying drawstring pouch before use. Once it is frozen, it will keep medication cool for an extended period of time without refrigeration. The Medication Travel Pack has a specifically designed inbuilt cooler system. The Medication Travel Pack has been tested to keep medication cool up to 8 hours within 2-8 degrees (refrigerated temperature). After this time, the Medication Travel Pack will keep medication cool and will protected from outside temperature and light for many more hours. Become an ATF Member and purchase your travel pack today. If you are travelling overseas using an airline, please note; no airlines will allow you to use on board refrigerators to store your medication whilst travelling. When travelling on aeroplanes, ships or any other means of travel that require security checks, with Oroxine or Eutroxsig in an ATF Medication Travel Pack, please ensure you ask your GP for a Doctor's Letter, stating the traveller is carrying specific thyroid medication which needs to be kept at a cool temperature in an ATF Medication Travel Pack. A MTP measures approximately 24 x 12 x 5-1/2 cm and will fit comfortably into most handbags and carryon luggage. To ensure your MTP arrives with you, never put your MTP in your check in luggage. You may also need to take a dose of Oroxine/Eutroxsig whilst travelling, so it is important to have it with you at all times. Once you arrive at your destination, remove your Oroxine/Eutroxsig from the Medication Travel Pack and place in a refrigerator. Place your Medication Travel Pack in a freezer to be ready for your return or continued journey. If you are staying in hotel accommodation and you do not have a freezer in your room, ask Reception to freeze your Medication Travel Pack in the hotel freezer. If language is a problem, ask that it is placed with the ice cream and not the milk and ensure you say it has to be frozen hard. The Medication Travel Pack comes in a drawstring pouch. Keep the drawstring pouch with your handbag or wallet to ensure you remember to remove your Oroxine/Eutroxsig from the refrigerator and retrieve your Medication Travel Pack from the hotel freezer before you leave. Do not store your Oroxine/Eutroxsig blister strips in the freezer with your Medication Travel Pack. Your blister strips are to be refrigerated only. It is a good idea to place a luggage label on your Medication Travel Pack zipper tag, with your contact details, in case you lose your Medication Travel Pack whilst travelling. If it is more convenient for you to take your Oroxine/Eutroxsig before you get out of bed in the morning or because you take other prescribed medications that needs to be taken early in the morning, or with breakfast PLEASE NOTE: ATF members have recommended freezing the Medication Travel Pack during the day and cutting your daily dose of Oroxine/Eutroxsig off the blister, making sure the tablets are still in the blister foil and placing in the MTP before bedtime. Place the MTP on your bedside table with water, ready to take your Oroxine/Eutroxsig as soon as your eyes are open in the morning, or in the early hours. Research states you should wait at least 4 hours after taking Oroxine/Eutroxsig before you take other medications. A Medication Travel Pack is a great idea to use when having a Thyroid Pathology Test. It is recommended a Thyroid Pathology Test be done as early as possible in the morning and after fasting from your evening meal the night before the test, (as soon as the pathologist opens in the morning). Take your Oroxine/Eutroxsig with you to the Pathologist in an MTP, with a bottle of water and take your Oroxine/Eutroxsig after the test is complete. Then wait at least 30-60 minutes before breakfast. 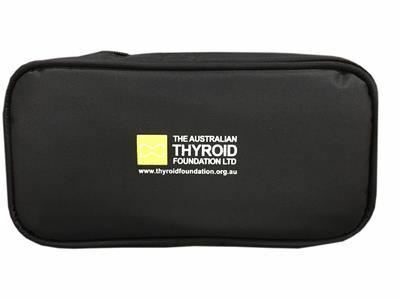 The Australian Thyroid Foundation (ATF) recommend The ATF Medication Travel Pack as an aid to control temperature of Thyroid Replacement Hormone, Oroxine and Eutroxsig for the specific time period if used correctly as per the included instruction sheet. However, to the extent permitted by law no warranty either implied or express, as to its efficiency is given by The ATF for individual use of the ATF Medication Travel Pack and the individual control of medication stored in the pack. The ATF Medication Travel Pack is available to members of the organisation to purchase.